Wildfires are raging in the western U.S., in what has been a deadly wildfire season. LOS ANGELES (Reuters) - Authorities in southern California ordered the evacuation of 82,000 people on Tuesday, after a wildfire broke out in a mountain pass to rapidly engulf 15,000 acres (6,070 hectares) of terrain. 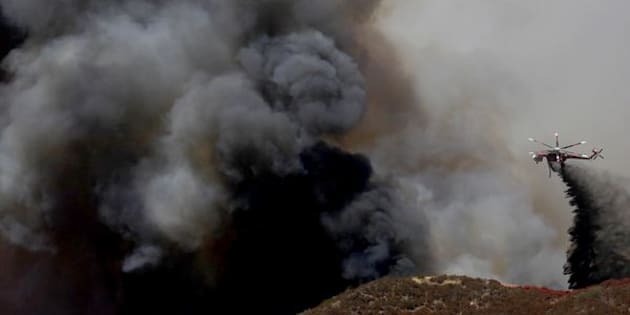 Officials said about 700 firefighters were battling to control the blaze in an area called the Cajon Pass, the latest in a series of wildfires that have blackened nearly 300,000 acres (121,400 hectares) of the drought-parched U.S. West. “It is a very fast-moving fire, it has wind behind it,” said U.S. Forest Service spokeswoman Lyn Sieliet. Two firefighters were trapped by flames in the effort to evacuate residents and defend homes, but managed to escape with only minor injuries, fire officials said. *UPDATE* #BlueCutFire is now 15000 acres with 0% containment. I-15 and Hwy 138 remain closed. The inferno prompted orders for residents of the community of Wrightwood, about 75 miles (120 km) east of Los Angeles, to leave their homes, said Lynne Tolmachoff, of the California Department of Forestry and Fire Protection (Cal Fire). The fire remained unchecked, having exploded within hours to cover an area of 15,000 acres (6,070 hectares), Cal Fire said, up from an estimate of 9,000 acres (3,640 hectares) on Tuesday evening.